Nicaragua is such a beautiful and fascinating place. No matter where I am, Nicaragua is on my mind! This blog will keep the excitement and pleasure of things, people and places of Nicaragua fresh every day! Please add information and send me pictures to use for Nica Picture of the Day! Send to vera@NicaArtGallery.com! Please send me your photos with a short caption if you would like to see your work on Nica Photo of the Day! Send to vera@NicaArtGallery.com! Thanks! You can support NicaPOD when you buy any book from Amazon through NicaPOD or by clicking on any google ads! NicaPOD needs YOUR photos with captions or short stories (150 words or less) about Nicaragua, or related to Nicaragua! The topics are unlimited -- whatever you find interesting. Send to vera@NicaArtGallery.com. Your name and email address should be included when you submit! Thanks to all! NicaPOD Contributor List: Send a Story & Add Your Name! The photos on this blog are copyrighted by Vera L.Y. Uyehara unless contributed by another person. In that case the photos are copyrighted by the contributor. Please contact the contributor through their listed email for permission to reproduce the photos in any form. Please contact Vera at vera@nicaartgallery.com for permission to reproduce all other photos on this blog. We lived in Managua for almost a year, and I fell in love with the art and artists! So I started several blogs (why not?) and a website to keep up with friends, artists and trends in Nicaraguan/ Central American art. But this blog is for everything Nicaraguan -- history, politics, science, health, business, tourism -- whatever is interesting at the moment! Please send tips and photos of what about Nicaragua is fascinating and important to YOU! I will try to put everything up on NicaPOD! "Flora y Fauna" by Solignia Arellano. Oil on canvas. 14" X 11". The primitive or "naive" genre of painting can be found around the world in virtually every culture. It is a special kind of artistic expression that speaks to the most fundamental emotions of the human species. The palette of this genre is often bright, deep and rich. The subject matter is timeless and easy to relate to, and the style is by definition straightforward and direct. Whatever the appeal, it has a universal attraction. 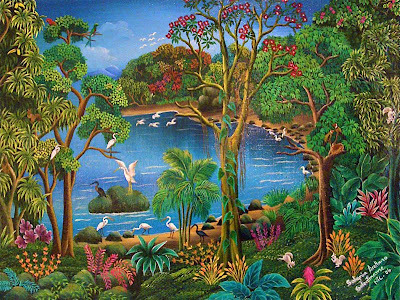 In Nicaragua, an unusual thread of primitive or naive painting developed in the island archipelago of Solentiname in the south end of Lake Nicaragua. The initial development of the artistic community of Solentiname came through the efforts of Padre Ernesto Cardenal who settled in the islands in the 1960's, and started a spiritual community. Over the course of ten years, he also encouraged the islanders to experiment with artistic endeavors. As a natural consequence, the artistic, spiritual and economic strands in Solentiname became intertwined, resulting in what has become known as "liberation theology". For more information see /www.nicaartgallery.com/artist/solentiname.asp. The artist who created the beautiful NicaPOD today is Solignia Arellano, of the famous Arellano family workshop.